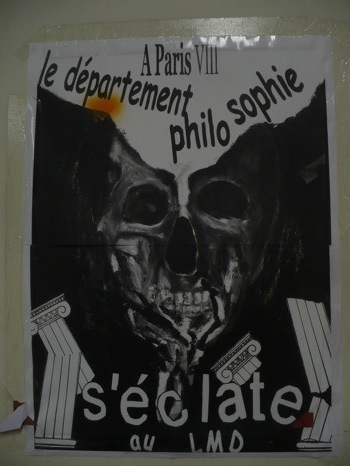 In the Philosophy Department at Paris-8, the biggest philosophy classroom is located just beside the department offices. 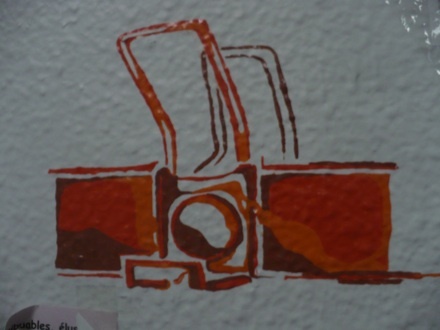 It has a variety of curious things on its walls. 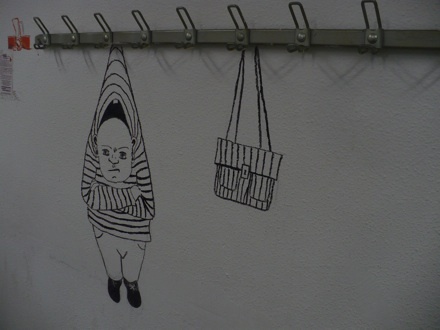 A painted character hangs from a coat rack. He appears striped. Bald. Stretched out by the neck. Striped shoulderbag too. My friend Emmanuel proposes that we translate this as, “At Paris VIII in the philosophy department, I saw the best minds of my generation destroyed by LMD.” Alternatively, “had our minds blown by LMD”… the Law LMD being one of the first university reforms of the last decade (2003). I’m not sure who’s represented by this skeletal face: the government? the philosophers? But I note the little hint of Greek architecture in the broken columns: classical Greece often seems to be iconic of philosophy in France (more, I think, than in philosophical circles I’ve come across in the U.S.). The Department of Philosophy Annual Party. Friday, June 29, 2007. Starting at 7:30pm. At Montreuil sous Bois, 6bis rue Dombasle. People’s House. Bus Stop: “Cemetery” and it’s to the right of Lycée Jean Jaurès. 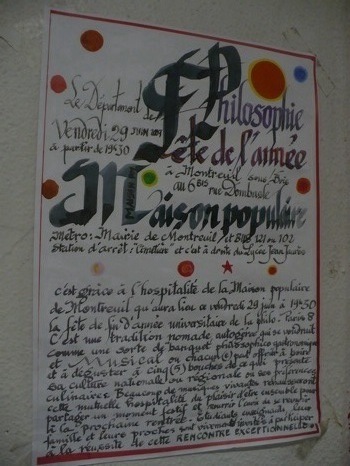 Thanks to the hospitality of the Montreuil People’s House, the Paris 8 philo annual party will take place this friday june 29th at 7:30pm. It’s a nomadic, autonomist tradition that sees itself as a sort of philosophico-gastronomical and musical banquet where everyone can share food and drink with five other mouths, everyone presenting their own national or regional culture or their own culinary preferences. Much live music will bring out our mutual hospitality, and our pleasure in being together to share a festive moment (and to nourish the wish to see each other again next year). Students, teachers, and their family and friends are strongly invited to participate in the success of this EXCEPTIONAL ENCOUNTER. Let me just note that, compared to the monochromatic deathscape of the last image, we see here a dramatically different style in indigenous art: more like the art of celebration than the art of nightmare political laments. It has the nose of a bull, a mouth full of baleen stuffed with gravel, the whiskers of a bloody mop and the facial shape of a television set (complete with little feet like a dimpled chin). 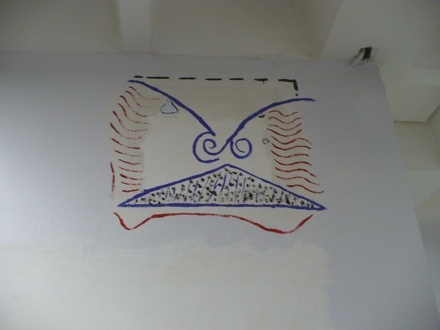 Don’t ask me what this face indicates, but since it was high up on the wall near the ceiling, I doubt many people look at it on a regular basis. 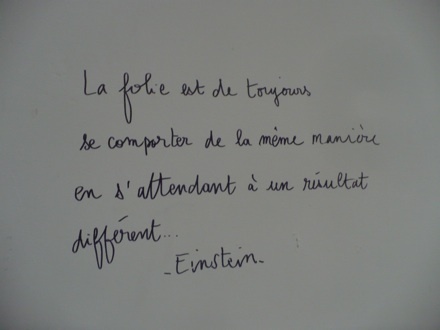 “Madness is when you keep acting the same way, expecting a new result… -Einstein.” There are similar versions of this statement in English, but I’ve never heard it was Einstein who said it. Still, it’s entertaining that a slogan that in a sense critiques repetition would be prominently displayed in a classroom, which is, after all, a place for the repetition of knowledge. It’s also entertaining that this (written) utterance of the slogan is itself a repetition of a well-known formula that has seldom been known to produce definite results — thereby also arguably performing what it criticizes. 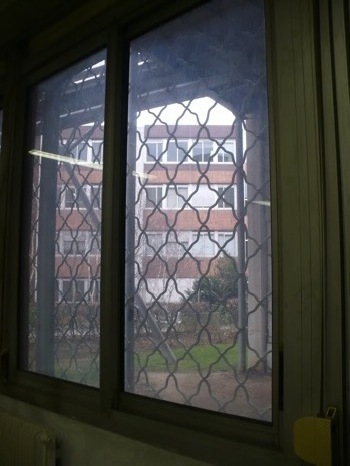 The view out the window is obscured by bars, or anyway a sort of anti-vandalism metal grating. Is it there to keep the philosophers in? To keep the masses out? Neither, but it does seem that its function is to make sure that the only way into the room is via legitimate possession of the classroom key, thereby maintaining physical control over academic space. Just a quick note to say that my favorite entries are the ones where you provide photographs of the buildings and grounds of the university. They’re tremendously evocative and occasionally even playful, such as the one of the man wearing a striped sweater, hanging on the coat-hook.